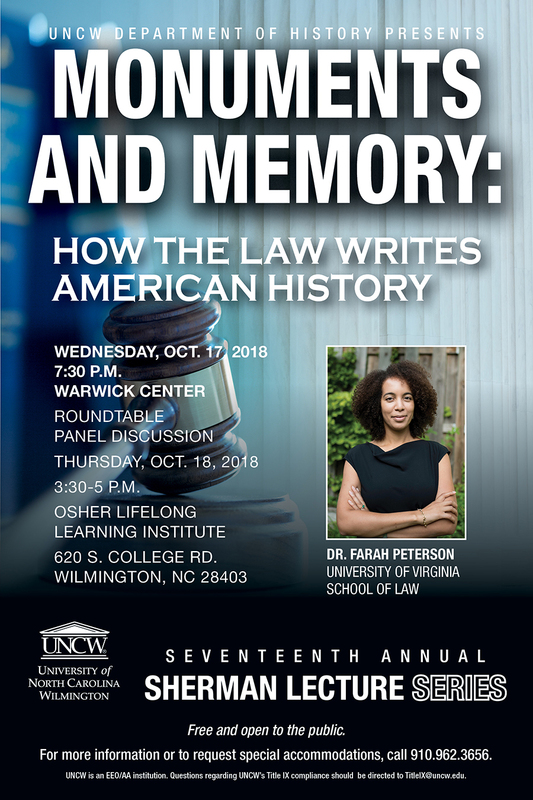 Since 2002, the UNCW History Department has hosted an annual lecture series established to honor two life-long learners and friends of the department, Virginia and Derrick Sherman. Each spring the department selection committee announces the topic of the upcoming lecture and conducts a national competition among junior scholars to select our Emerging Scholar. The chosen scholar visits the UNC Wilmington campus during the third week of October and delivers a major lecture on the Wednesday closest to United Nations Day. Lecturers visit classes, provide interviews to the local press and meet with faculty members. The lectures are published by the UNCW Publication Laboratory and distributed to UN Repository Libraries. For more information, contact Dr. Lynn Wood Mollenauer, Chairperson of the Department of History.